The Certified Hereford Beef® team kicked off the year in full force by marketing the Certified Hereford Beef brand at the 2019 National Grocer’s Association (NGA) Show in San Diego, Calif., and the 2019 Annual Meat Conference (AMC) in Dallas, Texas. 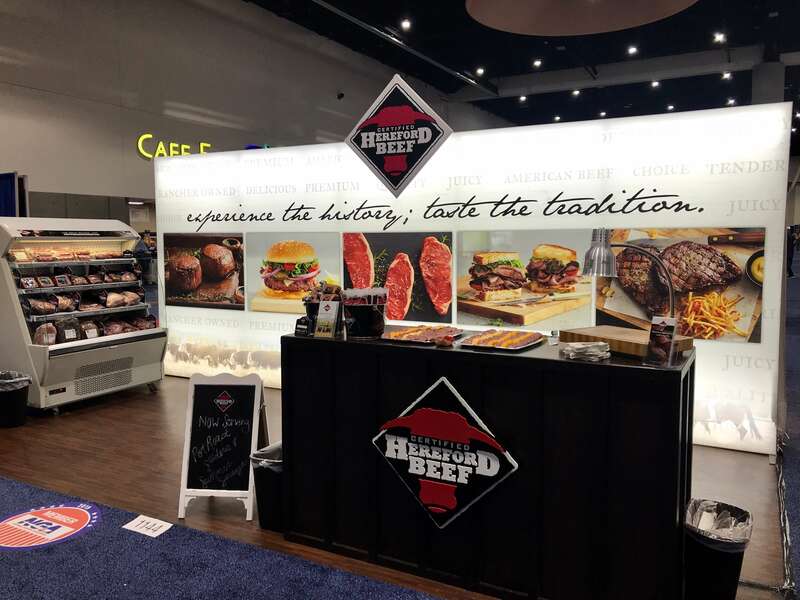 Certified Hereford Beef stood out on both the NGA and AMC expo floors, showcasing a new booth design focusing on the rich history behind the brand and the premium products offered to help retailers succeed in a competitive marketplace. The team sampled several new products during both of the shows, including a ready-to-eat Certified Hereford Beef pot roast; sous vide prime rib and four varieties of summer sausages. The team focused on value-added items due to their increasing popularity in the millennial generation because of simple and easy preparation methods. The Certified Hereford Beef team also showcased retail-ready items like cut steaks and ground beef bricks, which provide solutions the brand can offer to retailers. In addition to the expo food shows, both NGA and AMC provide attendees access to more than 100 educational seminars and sessions to further their knowledge about the newest industry trends and technologies. Overall, these two shows provided the Certified Hereford Beef team with the tools, resources and leads to continue the brand momentum and catapult the brand to success. Each year, the NGA Show hosts more than 3,500 independent retailers and wholesalers, food retail industry executives, food manufacturers and service providers for unparalleled opportunities to learn, engage, share and network. The Annual Meat Conference hosts more than 1,600 high-level retail executives focused on one thing – the newest innovations in meat and poultry products retailers need to increase their bottom line.